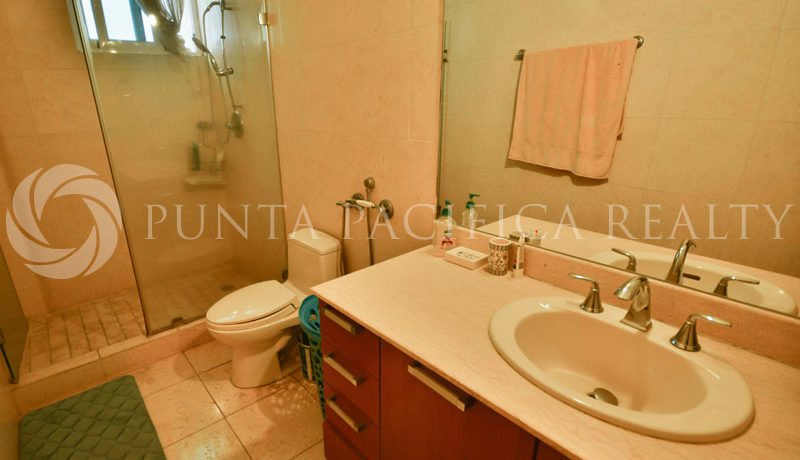 This is Punta Pacific luxury at its finest. From the building’s elegant lobby to the finishing, this apartment offers Central America’s finest lifestyle. The apartment is a total of 565 m2. This 4 Beds, 4.5 Bath, 4Parkings, the unfurnished unit is superb in every way. The Layout is open and bright and the amount of sunlight is incredible throughout the day. The views of Casco Viejo, Cinta Costera, Paitilla are endless. You are front and center to the Pacific Ocean and all its wonders. There are four bedrooms with full bathrooms in each, a guest bathroom off the dining room and a full maid’s room with full bathroom.The master bedroom, living room, dining room, and office are controlled by central air conditioners. The kitchen has top of the line appliances, gas stove, double refrigerator, and dishwasher. Bahia Pacifica is a luxurious 40-story waterfront residential building in Punta Pacifica, often called “the Beverly Hills of Panama City.” It’s home to holds 57 apartments, ranging from445 square meters to 743 square meters, with three or four bedrooms per unit. Neighboring the iconic Trump Ocean Club, Bahia Pacifica offers luxurious apartments with wide terraces, walk-in closets, modern kitchens and maid quarters. Residents have breathtaking views of Panama City, Ocean Reef Island and the beautiful bay. The building includes a large oceanfront pool, gym, squash court, and sauna. All of Punta Pacifica’s amenities are within easy walking distance, including shops and restaurants and the Punta Pacifica Hospital, which is affiliated with the world-famous Johns Hopkins Hospital. The Building offers a full workout room, showers, dry sauna, steam sauna, pool, and party room. There are 24-hour security and concierge service. You will feel like you are on top of the world as you lounge on your spacious balcony, enjoying unparalleled vistas of the Pacific Ocean and the surrounding city, the business and cultural hub of the region.